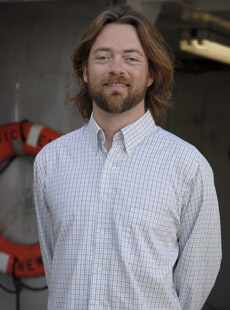 Tim is a Research Specialist in the Coral Reef Ecology and Optics Laboratory (CREOL) and with the Marine Environmental Program (MEP). He received a BSc degree in Biological Sciences specializing in fisheries from King’s College London in 1998. After a 4-year hiatus from science working in the finance industry, Tim returned to King’s College London to complete a Masters in Aquatic Resource Management, in 2003. Tim first came to BIOS in 2004. Tim’s primary role is to facilitate the day-to-day running of the various basic and applied research projects conducted by CREOL and MEP. Such duties include but are not limited to, project logistics, field operations (boat captain, data collection and scientific dive training), and training and mentoring staff, students and interns on the various scientific methodologies utilized by the lab. Tim’s current research interests focus on coral reef fisheries. Currently his project is assessing reef fish populations around the Bermuda platform using Baited Remote Underwater Video Stations (BRUVS). The aim of the project is to provide quantitative data on reef fish populations, distribution and habitat utilization. In addition, he is also interested in investigating point/diffuse source pollution and dredging related activity within coral reef environments. Tim is currently accepting interns.